It's St. Patrick's Day and we've been looking for fun content we can share with you related both to cars and our favorite March 17th celebratory activity. DeLoreans? Meh. Irish Car Bombs? Blarney-riffic! 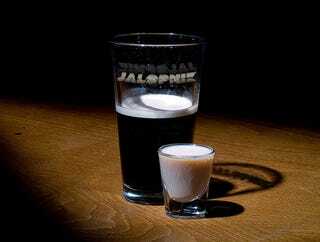 If you're like us, then you've probably had an Irish Car Bomb before. We were pretty confident that we could make some that would knock yer socks off, but to give you the most accurate mixing of our three favorite types o' booze, we went the official route and received a true recipe from Drinksmixer.com.